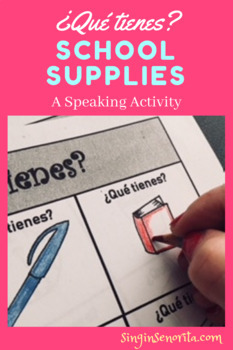 Speaking Activity School Supplies & Color-¿Qué tienes? This product includes 36 squares with 31 different school supplies and classroom items. Each picture is hand-drawn and in black and white. 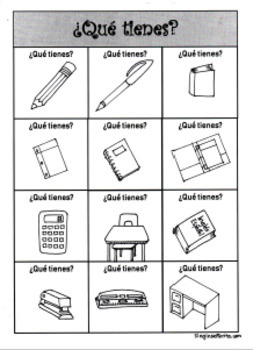 Each square is titled "Qué tienes." You may use the squares with or without color. Students must ask each other the question and say what they have on their own card. Then they must trade cards and find a new partner. The activity works great to review adjective agreement and school supplies.